Have you ever looked at a piece of needlework in stunned silence, turned it around in your hands, looked closer, turned it over, touched it, studied it, then looked up and said to anyone willing to listen – “Oh gosh. You’re just not going to believe this thing!” And then shown it off, to find that your reaction isn’t an isolated one? 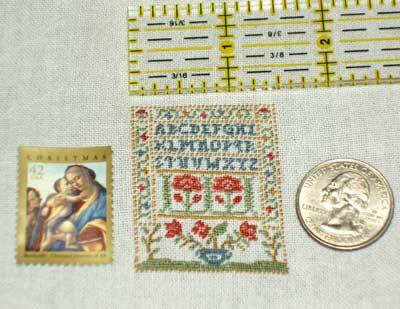 That’s right – this tiny little detailed sampler is 1 3/8″ x 1 3/4″ – not a whole lot bigger than a postage stamp! 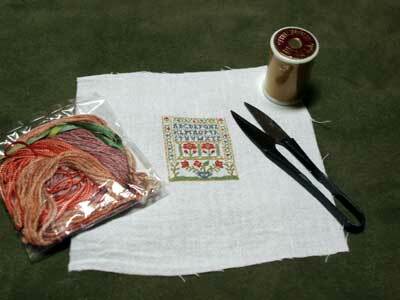 Christiana embroiders miniature things. 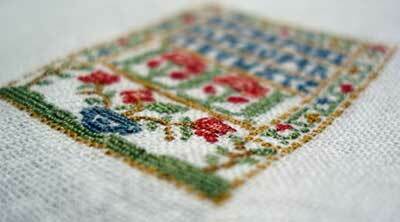 She uses kitchen towels (flour sack towels) for her ground fabric, stitching over one thread in the towel. The stitches are half cross stitches (or tent stitch), and I think she uses one strand of embroidery floss – but it’s so incredibly tiny, that she might be using regular thread. She’ll have to enlighten me on that! Now can you understand my reaction? I was awe struck! I never considered doing miniature embroidery like this, but I can see how it would be perfect for a number of little applications – doll houses, for example, come to mind. But there are other uses, too: a little special pendant or to adorn the lid of a little tiny box… I haven’t decided what I’m going to do with it yet. I’d like to find the perfect small frame for it, so I can display it. Along with the sampler were some other treats: a spool of Tire Silk, some Japanese snippers, and a nice little package of Glorianna threads and ribbons! Thank you, Christiana, for the sweetest of little Christmas presents! I just “showed” the pictures of this miniature to my husband and as we went down and came to the one with the quarter he just said, “WOW” too. What a delight! I have to admit I wasn’t all that impressed with the first few pictures of the sampler…just another sampler. 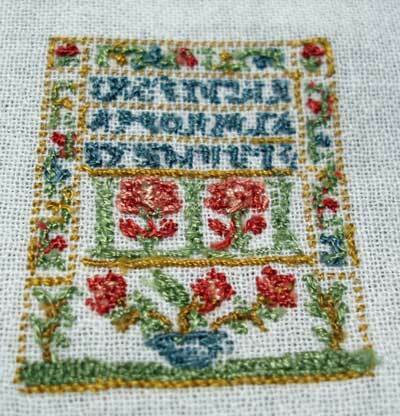 I’ve done a few in my time and they are not my all time favorite needlework, but this one was pretty enough. But then the picture of the sampler next to the stamp and quarter…OH MY! Now THAT is a work of art! I am just curious to know what kind of heavy duty magnifying glass she uses to work this sort of miniature. I know my eyes could never handle something like that. Amazing! I just thought of a real bonus for doing samplers this small…they probably wouldn’t cost a week’s salary to have them professionally framed! Oh Wow!I signed in to respond to your amazing work on the liturgical thingy,which I’ll go back to, but I couldn’t NOT comment on such an amazing wee sampler! Mary, I SO LOVE your site!Thank You! This wee sampler is amazing once you get down to the postage picture, truly, WOW!! I think I would get a very nice tiny box, put this sampler on top and store my postage stamps in it so that I would see it and admire it every time I had to use a stamp. Besides that would keep it on top of my desk were I could glance at it all day long. TO MG McNamara: Mag-eyes makes a 5x magnifying glass that attaches beautifully to your eye glasses, so it’s hand-free! I use it on 32 and 40 count fabric and it’s fabulous. Mary – WOW! How fantastic! But even more amazing was the work you did to get the liturgical thingy (thanks, Charlie, for a name I can handle!) completed in such a short time. It is absolutely stunning. I am in awe of the work you do and look forward to seeing what’s in store for 2009. Happy New Year to you! Like Charlie, I signed in to comment on the maniturgia (d’you mind if I say twice that I appreciate it?) but had to comment on this too . . . I’m on (vveerryy ssllooww) dial-up so I read the text before looking at pictures, but I think it would have been “what IS that? !” even if I’d seen the pics first. That is amazing. I 2nd the postage-stamp-box cover. Fabulous but way out of my element! My eyes are crossing just thinking about working this small! What a piece of wonderful art you have and what a special friend to make it for you. AMAZING…not in my wildest dreams could I accomplish anything like this. It’s beautiful!!!! You know, I think I would have this framed with a nice wide mat, to emphasize the teeny-ness of it. Amazing work!!! 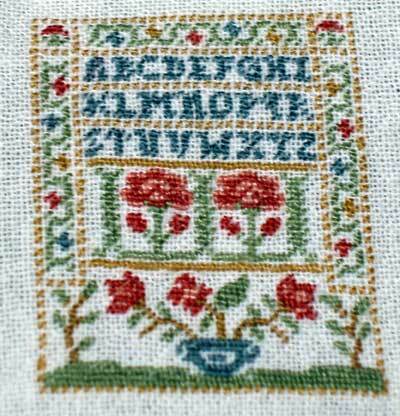 I love this little miniature cross stitch and wish I had it. It is exquisite.